Want to create some awesome jewellery holder with waste materials? Here you learn easily how to make Creative Jewellery stands. All the time I lose something, and I cannot complete a pair of earrings. Everything is tangled, hides magically and generally does not present well. I found an ideal solution of my problems – it’s a jewelry stand organized with a jewelry organizer – jewelry trays show what you have & easily decide what to wear with a jewellery stand or ring holder. Get some ideas on how to make your own jewelry organizer to display your lovely jewels in style. You can make your own jewellery holder in few easy steps at home. 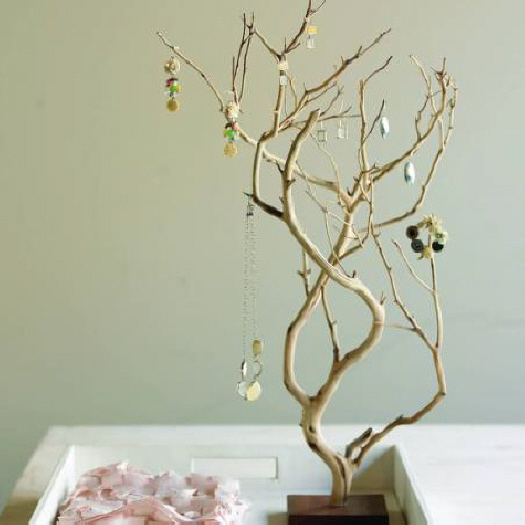 To make a beautiful and creative Jewellery tree you just need a branch of old tree. 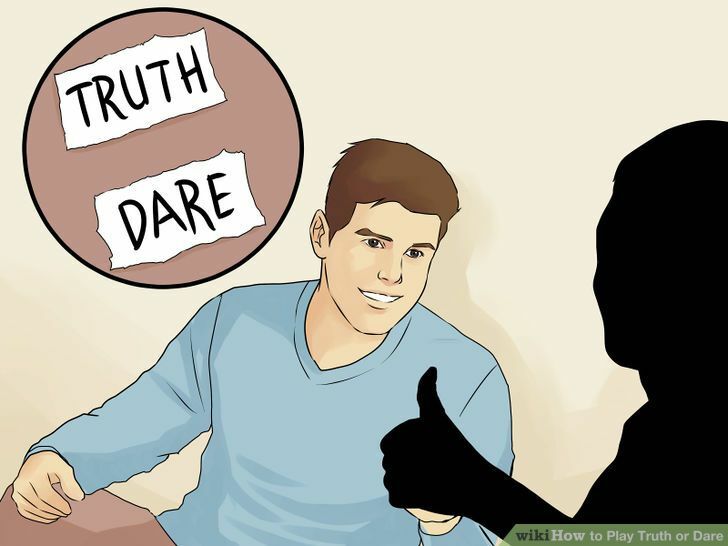 You can stick it on a platform like a piece of cardboard with glue. To make it more beautiful you can paint the small tree with metallic colors. The Jewellery tree is ready. 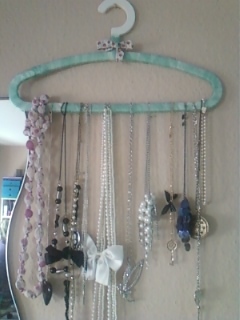 Now you can hang your Bead earrings, bracelets, necklace on it but make sure they are not so heavy to handle. The Hanger Jewellery holder is a creative holder for your special necklaces. You can make it in easy steps with an old hanger,some colorful threads or paint. Take an old hanger it may be from plastic or metal. Wrap the hanger with colorful thread. You can also paint it with your favorite color. Drawing some patterns with color is also an good option. This is the easiest Jewellery holder you can make to organize your favorite jewellery. Organize your bangles is a difficult task for a girl. 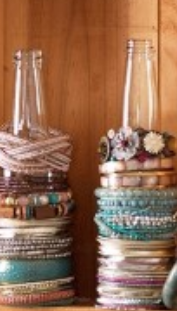 You can use old bottles as a bangles holder. You have to just clean the bottle and place it in front of your mirror and put your bangles. It looks beautiful! 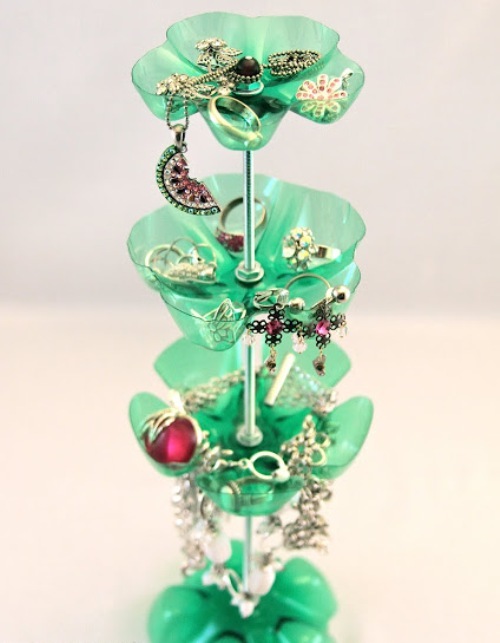 To make a plastic bottle Jewellery stand you need 3 or 4 plastic bottles of different sizes. Cut the bottom of plastic bottles with scissors. Cleanly place them in a rod. For a creative look you can use bottles of different color also.